If you’re looking for the Wednesday Wandering, just page back and join me as I look at the impact the novels on me… And wonder if there might be a place for fiction in the non-English lit classroom. Then join me and Alan as we venture into the outback. JANE: Last week, our friend Chip suggested we go out to dinner at a Australian-themed steakhouse. JANE: No. Nothing like that. It’s called Outback Steakhouse and, as far as I can tell, the only thing Australian about the place is the decor. There are lots of kangaroos and boomerangs. Some of these are painted with designs that I think are meant to evoke traditional Abo art. Wait! Is “abo” still an accepted term? Aboriginal art is really very distinctive indeed, quite pointilliste in some cases, though the dots are rather large. Robin has laid some concrete in our back garden and embedded coloured stones in it to form the shapes of a snake and a goanna (lizard), which is a very aboriginal style. I went to an exhibition of aboriginal art in Melbourne once. It was like nothing else I’d ever seen before and very, very beautiful. JANE: What Robin did for your back garden sounds lovely. I think an aboriginal style is what the steakhouse decor is trying for, but they get a bit lazy and go for wide stripes in bright colors. ALAN: That works as well. Maybe in order to understand Australia, I need to start with the basics. Just how Australian is a meal consisting of some form of steak, soup or salad, and a side of your choice? ALAN: That sounds like a rather ordinary meal to me, something you might get in a restaurant in any country in the world, including Australia, of course. But there’s nothing distinctively Australian about it. However, there certainly are food items that can only be found in Australia, though presumably they get exported as well. Kangaroo is the most obvious one that springs to mind. I think it is a lovely meat. It combines the sweetness of lamb with the texture of beef and is really very tasty indeed. Unfortunately, Robin refuses to eat it because when she was a child, kangaroo was what they fed the dogs with. “You’re not feeding me dog tucker!” she tells me in no uncertain terms. Emu are also farmed quite intensively and the meat is generally available in restaurants. Interestingly it doesn’t taste like chicken, as you might expect it to. It tastes like emu. JANE: Which tastes like? Turkey? Goose? Ostrich? Cheddar cheese? ALAN: Surprisingly, emu is a red meat. And, unlike other fowl, it is often grilled and served rare (though personally I prefer all my meat a little more well cooked than that). What does it taste like? Well, since you won’t let me say it tastes like emu, I think I’d probably have to say it tastes like venison, with perhaps a hint of beef. Australians are also very fond of their seafood and Moreton Bay Bugs are often to be found on the menu. These are a kind of lobster, which are very popular indeed. I’ve also eaten crocodile, but that’s considered rather exotic and you rarely see it on offer. JANE: What about side dishes? Are there any typically Australian vegetables or ways of preparing vegetables? JANE: Actually, serving salad separately is more a restaurant thing. I think they do it that way to give you something to do while they’re preparing the main course. I’d try a watermelon and onion salad, but I don’t think Jim would. He doesn’t like watermelon! 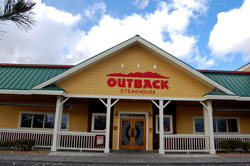 I’ve remembered something else Australian about the Outback Steakhouse, but that’s going to have to wait for next time. ALAN: Fair dinkum, cobber. She’ll be right. JANE: She? Okay… I see we have a lot more to talk about! This entry was posted on January 19, 2012 at 1:00 am and is filed under Thursday Tangents. You can follow any responses to this entry through the RSS 2.0 feed. You can leave a response, or trackback from your own site. I’m surprised you guys didn’t talk about mutton! When I was in Australia the people I was hanging around with said you couldn’t be Australian without liking lamb. Granted, I was living in a college with a bunch of sheep farmers’ kids. Also I mentioned once that many Americans didn’t like onions because they were too strong. The Aussies were aghast! Not liking onions?? Crazy Americans! Then I realized that they treat all onions like raw poultry and caramelize them into oblivion. Well, sure, once you take all the bite out of it… Maybe it was just the Adelaide area. But you are right about mutton, lamb, and the offal (liver, kidneys etc) — these surely are the foods of the gods. Nothing else even comes close. I’m in danger of dribbling onto my keyboard as I type these words. How can anyone not like onions? Raw in salads of course. And I often use finely chopped raw red onions sprinkled as a garnish on casseroles and curries. Good to know that South Australia doesn’t represent the whole country. Maybe it’s a bit like going to Kansas in the United States. No, nevermind, it could never be that weird. I thought there was more to bush tucker than witchetty grubs and roo-tail soup. Honey ants for example. Or quandongs. Or bush peppers. Or goanna. Of course, I can’t say much, because acorn bread and pinole aren’t exactly on most people’s menus here. They’re not bad though, not bad at all. Maybe I should give up on a writer’s blog and do one on food instead. We always end up back at food. Seriously, though, all this does have relevance for writers of fiction. Too often, cultures are simply thinly disguised variations on the one in which the author lives. Or of what the author imagines Medieval Europe to be… with middle America blended in. Hmm… I see a blog coming on.